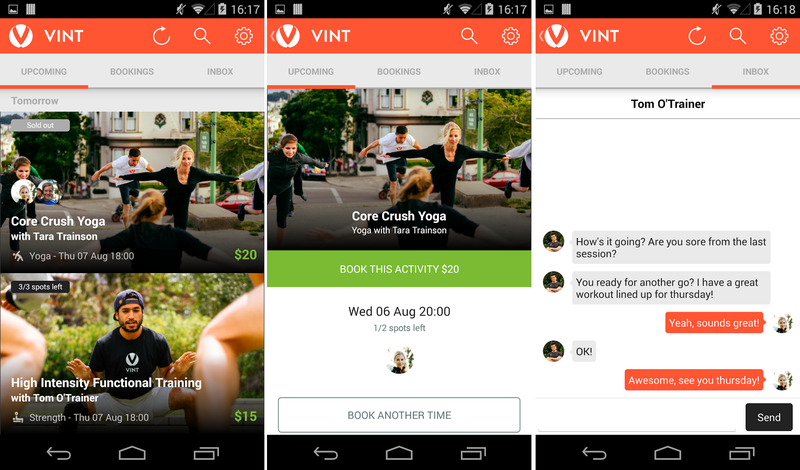 If you’ve always wanted a personal trainer but found the expense a little off-putting and lack the motivation to keep working out on your own, then help may be at hand in the form of Vint’s new mobile apps for iOS and Android, which promise to make finding a local training session a doddle. Currently only available in San Francisco and building on an open beta of its Web platform announced last year, the peer-to-peer platform allows users to take part in nearby one-on-one or group workouts at a price set by each individual trainer. The company says that the average personal trainer costs around $120 per hour, but that trainers on Vint cost an average of around $20 for an hour session, although, it can actually range from free to more than $35 per hour depending on the trainer’s expertise and area of specialty. For launch, there are more than 50 “hand-qualified, passionate athletes and instructors” available to give guidance and lead workouts across 15 different activities, including running (trail and distance), yoga, weightlifting, tennis, Tai Chi and more. The company says all its trainers are vetted and rated through a “rigorous qualification process based on their knowledge, understanding of safety, teaching ability, social skills and passion”. It’s this personal attention to detail which means that for now it has no plans to move into the digitally-delivered workout space, a spokesperson confirmed. [There are] no plans currently for offering digitally-delivered workouts — there are other services which do offer this, and we believe the motivation and relationship-building that comes with an in-person experience is key to building a long-term fitness habit. Vint, much like Lyft or Uber, is dependent on having an amazing offline community (fitness trainers in our case), and so we have to launch each city as the supply side of trainers grow. For now, it’s only available to people in San Francisco, but the spokesperson also told TNW that it will move quickly to launch in new cities based on demand. So if you want to see it in your city, start shouting.